Is Locategy really the best the parental control app market has to offer? Locategy is essentially a parental control app. It supports platforms such as iOS and Android. Locategy can keep a track of the user’s children’s location and activities. And it does a pretty good job of it. But it could use some more refreshing ideas as far as its design elements are concerned. Moreover, if the company wants to expand its user base it will have to improve its web filtering capabilities. Currently these only work with a few number of web browsers. Chances are that just like everyone else, your children have started to spend most of their time on tablets and smartphones as well. And we know that parents find it difficult to make sure of the fact that their children remain safe while they surf the internet. What kind of problems are parents really looking at when it comes to their children using the internet on their mobile phones and tablets? Well, to start off, you have all those inappropriate websites that expose children to disturbing images. Then parents also have to deal with the fact that their child might come into contact with a sketchy “contact” of theirs. Children are prone to excessive use their tablets and smartphones as well. In short, smartphones of the modern world present all sorts of problems and threats to any child. And the child’s well being. So what does Locategy do? It basically hopes that parents would use the company’s software and regains some of their lost control. As mentioned at the top as well, Locategy is basically a parental control app. And as you might have noticed already, Locategy doesn’t give you protection for some major platforms such as Mac computers and PCs. Perhaps that makes sense as well. Locategy’s best features come in the form of location tracking tools. That’s why the company has named itself after “location”. Locategy also offers some basic app blocking features. We give it good marks for ease-of-use as well. Of course, we can’t overlook the fact that Locategy isn’t as full-featured parental control app as some of its competitors. Regardless, it is still more than a viable option for parents who want to keep a tight handle on the activities of their children while they are enjoying content on their smartphones and tablets. As far as price goes, Locategy definitely falls into the category of good value for money. The company tries to operate on a freemium model. It offers users to sign up to three smartphone devices which they can monitor with Locategy for free. The free model, as you might have expected, comes with certain limitations. For example, the free account allows parents to only define at the most two Places when they want to use the application’s geofencing features. Moreover, the free account only allows parents to block just one/single mobile app on their child’s mobile device. The free account also saves only five days worth of reports. Those five days include the current day as well. This means users can only view data related to call logging, apps, web, and location for the past four days. You don’t need us to tell you that the free account is sufficient for those parents who just want to ensure that their kid kept out of trouble while surfing the online world and traveled safely between school and home every working day. Our research shows that some users will find it hard to find Locategy premium subscription package price information. Modern online services rely on the effectiveness of their communication channels to attract as many customers as possible. Once a company messes up this part, it stands to lose a good bunch of them. The first problem with upgrading your free account to premium account is that you can only do so via the app. You’ll have to press the upgrade button in order to proceed. Locategy is based in Spain. Hence, the prices that Locategy offers to users in United States Dollar amount are actually approximate prices. The premium tier of Locategy’s service costs users around $20 USD for a total of three device licenses per year. If the user wants to increase the number of devices to 5 licenses then the price will go up to $35. For those looking to protect 10 of their devices, Locategy will charge them $70 per year. Parents who want to monitor and protect more than 10 devices will have to contact Locategy customer support staff in order to get a custom rate. All users can avail the 15-day trial period from Locategy to experience the company’s Premium services via a Premium account. Just for comparison’s sake, Locategy’s competitor Boomerang, charges each user $12 per Android device per year. Boomerang also gets one over Locategy due to the fact that it offers its services for free on the iOS platform. FamilyTime, another Locategy competitor, offers just two licenses for $35. That is the company’s cheapest subscription package. The company’s base account charges users $54.95 per year to monitor 5 devices. But Qustodio blows most of the competition out of water because of the fact that it supports platforms such as PC and Mac. Along with that, Qustodio also offers support for tablets and smartphones. Did we forget to mention Kaspersky Safe Kids? That parental control app costs users $14.99 per year. But the good thing about Kaspersky Safe Kids is that users can protect an unlimited number of devices with it. Unlimited licenses for just $14.99 per year. Moreover, Kaspersky Safe Kids supports each and every major platform that you can find in the market today. Locategy offers its apps via the App Store and the Google Play Store. Both apps are essentially the same. In fact, Locategy has a single app and it offers that app on both platforms. After installing the app, it will greet the user with a couple of introductory screens. When the user has dealt with those then the app will require the user to log in. If the user doesn’t have an account already then the app will provide options for the user to create one. Locategy also requires the user to select either a child profile or a supervisor profile in order to move the setup process forward. If the user chooses the child profile option then he/she has to approve several permissions. This is the point where users need to exercise some caution and remember to disable the Guest account which comes with most Android devices. Because Locategy can’t apply any of its restrictions on a Guest account. There is nothing weird here. In fact, it is very typical of most, if not all, parental control app options. Locategy Premium should work on all smartphones regardless of the hardware strength. Of course, if you have a smartphone like Nexus 5X and/or Google Pixel, then your experience with Locategy, and any other app, will be much smoother. Locategy supports Android 8.0, so there is nothing to worry about if you are using the latest version of Android on your smartphone device. Locategy also works with iOS devices running the official iOS 11 such as iPhone 8 and others. This review will mainly talk about the Android app though. We will talk about the Android app details and the experiences users should expect. Of course, there are some differences between the Android app and the iPhone app. And we will try to detail those towards the latter part of this Locategy review in a separate section. The official Locategy web interface has a minimalistic feel to it. The problem our research showed with the interface was that the size of the icons looked a bit off. That also holds true for the way Loctegy presented the options to the user. Most elements on the page have plenty of padding around them. With that said, perhaps we should appreciate the fact that they have used a bright blue scheme as far as color is concerned. The web interface also has highlighted section for aid navigation. These two have that lovely bright blue theme. Locategy labels the main page of its web interface as My Family. The My Family page shows the complete list of all of the user’s existing devices that Locategy is monitoring. It also shows the respective locations of the devices via a map. Users are free to select any and all of these icons in order to access individual reports and restrictions. There is an alternative approach as well. Users can make use of the menu on the right-hand side to choose any of their Locategy monitored devices. There are many other options such as Places. The Places option is part of the menu that appears on the right-hand side. This is basically the geofencing feature of Locategy that we talked about before. There are other links to the FAQ page of the company and also to account settings page. Our research shows that Locategy web interface should perform as smooth as it gets for the most part. But do expect stutters from time to time. Locategy does not protect its user accounts via two-factor authentication. Even then, the company claims that it encrypts all the data that the company records from and to the company’s data centers, app, and website. So where are these data centers located? They are located in the region we know as Ireland. Locategy makes use of Amazon Web Services to manage its data centers. Additionally, Locategy also claims that none of the company employees have any type of access to their user accounts. The only access that they have is to a very basic user profile which only gives away the minimal amount of information. As in the case of the web interface, Locategy tries to implement an identical or near identical layout and design on the company’s mobile apps. But the overall impression is reasonable because the company actually resizes the whole layout for the much smaller screen of any mobile device. Now, because of the fact that the mobile screen is a lot smaller than a desktop’s screen, the top border actually gives off a more appropriate look in terms of its size. We can’t say the same about other elements though. The options menu and the icons do give off a messy and cramped look. We don’t want to sound suspicious but the look and feel of the app make us think that the app isn’t really a dedicated app. It is a web wrapper. The other reason why we feel this way is because of the occasional hang-ups in terms of performance that you are likely to face while using the Locategy Parent app for Android. As before the My Family section (which is the default section) shows all of the user’s family accounts which the user has linked with Locategy. The app uses an interactive map to display those accounts. As mentioned before, the web interface makes use of similar techniques to show data. And just like before, there is a menu on the right-hand side of the screen. It is exactly the same as you saw it in the case of Locategy web interface. On the other hand, we do appreciate that the company has made an effort to integrate the FAQ section directly into the mobile app itself. There is no reason to not like the integrated mobile search bar as well. Beyond that, the app expands various other topics of interest in-line. Locategy mobile app breaks down the child profile page into three distinct categories with the help of three different icons. Locategy denotes these icons with a location pin, a shield and a phone which is in a hand. It is useful for readers to refer to all the three sections as Restrictions, Reports, Location. And this is how we will proceed for the rest of this Locategy review. The reason why we do that is that there are no official descriptors apart from these icons. So we have to make our own to make it easier for our readers to follow. Locategy breaks down the last two section, Restrictions and Reports, into further sections. The company does that with a series of icon tabs that appear in rectangular shapes on the bottom of the user’s mobile screen. Users who want to access these icons have to tap the sections individually in order to do so. If a user swipes in the horizontal direction instead, the app will switch between the other three main sections that we mentioned before. Yes, we agree, the navigation plan is slightly confusing. The fact that there are three menus which Locategy app represents via horizontal lines and then there is one which the user can access and control only by swiping across his/her mobile screen is certainly disorienting. By the way, those who are still confused about the three main sections, these are the call history section, web section and the location section which allows users to select days. If the user clicks on any of his/her children’s device which Locategy is monitoring, the app takes the user to the official Location tab. The Location tab is basically a section which displays an interactive map. This is where users can view the current location of their child. There is also a button labeled Show Location History. Users who want to consume more information about their child’s protected device should go ahead and access the Show Location History. The Location History shows an area with a series of dots, which are blue in color, on the map. These blue dots correspond to the user’s child location for every couple of minutes for the given day. Users can make use of the slider option to scroll through any of the selected days. The app makes use of simple but effective directional arrows just above the interactive map in order to allow the user to modify the current date. Or more specifically, smart enough. It is smart enough to calculate and recognize that the user has stopped moving. After that, it quickly records the literal address of the current situation. Not just the coordinates of the said position. There is one oddity though. Users don’t have the ability to add one of the location pins as their dedicated place and/or places. Hence, users will have no other option but to re-enter custom locations using manual methods. By that we mean they would have to do so via the app’s Places section. This actually is available in the menu that appears on the right-hand side. If the user performs a tapping action on any of the given data, the app shows two small icons. These icons actually appear somewhere else. More precisely, in the lower right corner of the screen. They redirect the user to other important apps such as Google Maps. It does that so Google Maps can show the user the step-by-step directions to the custom place. The options also allow the user to go to a detailed page about the location they have chosen beforehand. The dots aren’t that bothersome though. Because they can blend in. But only in some given areas. Additionally, they can also overlap other dots. Our research shows that the location tracking features of Locategy worked reasonably well enough. Users shouldn’t have a problem in telling the difference between the user walking to his/her office and/or riding via the subway back from or to the office/home. Our research also told us that Locategy doesn’t really face any trouble when it tries to log in the exact and precise walking route that the user might take to a place, say, a restaurant. It can even do so for places that you have never visited before or have visited only once or twice. You already know that Locategy has a location section. This section has multiple components. The component that we want to talk about right now is Places. This is basically how Locategy defines geofencing. Users can access this option from the menu on the right-hand side of the screen. Users can simply tap the link and then specify a particular name for any Place. Then the app allows them to enter the place’s exact address if they want to. After that Locategy can easily create a 150-meter boundary right around the point that the user had defined earlier on the interactive map. As soon as the user’s child leaves or arrives at that specified area, the app will alert the user and notify him/her as well. The app doesn’t give users the ability to set supplementary boundaries which overall the original boundaries. This means that the geofencing feature isn’t the perfect solution for large areas such as campuses and buildings. We have found that Locategy’s competitor Boomerang offered a more flexible approach. It allows users to draw their own and custom boundaries around a given point and/or area. Other parental control apps such as Kaspersky Safe Kids allow users to go ahead and set up their own schedule for when their kid/child would/should remain in the custom-defined geofence. Parental control apps such as Qustodio and Norton Family are far behind in this regard. Because, believe it or not, they don’t offer capabilities such as geofencing. Our research also shows that if you use Locategy for a period of a full week, it will not miss a single notification. A hundred percent success rate at sending the user a notification each time the user leaves or arrives at his/her office or home/apartment. Why is this feature so useful? Well, for parents, it is useful because it allows them to ensure that all of their children and get to their school and then come back on time and in a safe manner each and every work day of the week. Of course, there is the chance that the child might just throw away the device out of a window or destroys it. But in that situation, no software application on earth can help you. The mobile version of the app also produces reports. As mentioned before as well, Locategy breaks down its report section into three discount sections. Then it breaks them down even more and shows them on the bottom of the screen. Let’s start with the Apps section first. 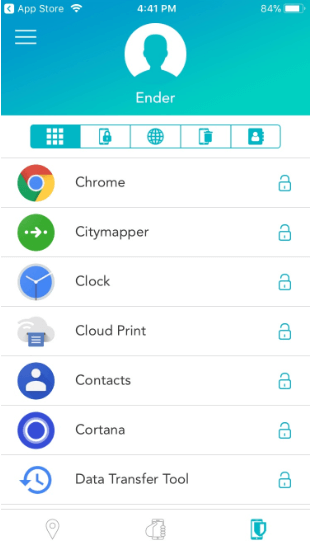 Locategy is a good enough parental control app that it can log all of the mobile apps that the user’s child uses or launches every single day. And it will list those apps for the user in a descending order based on how much time the child has spent on a given mobile app. Users do have the option of viewing more details. For example, users can easily tap on the expand arrow button and then look at the right-hand side of each app in order to see and monitor each and every time the user’s child opened the app. The expandable arrow button will also show the user how long their child spent on the app in any given session. This is similar to the Location section. Users can easily switch between current day and some other defined day. They can access this feature via the top menu on the screen. Let’s talk about the calls section now. It is very similar to the Apps section in the sense that it also shows a similar type of information. This section is useful for users who want to view a complete log of all outgoing and incoming calls. Moreover, users can view statistics related to each given day. The logs also show the duration and the exact time of each call. With that said, the app doesn’t give the user any opportunity to interact with the information. Or any of the displayed data. The data that it shows is basically a log of the entire mobile activity. And of course, nothing else. The third section is the Web History section. It functions just like the previous two sections. We mean that it displays the complete list of all the websites that the user’s child has visited. It also displays the time the child accessed the websites that are found on the list of websites. Users can’t click on the links though. At least, this section won’t allow that. Hence, users can’t just look at the list and visit the page they want to check out their child visited before. The app does highlight all log entries though. It does so via the red color. The app also displays a lock symbol or icon if it recognizes that the user’s child visited apps from the blocked list of websites. If you click on the action tabs, Locategy will show you a further five distinct categories. The app section does what you would expect it to do. It can also apps permanently as well. 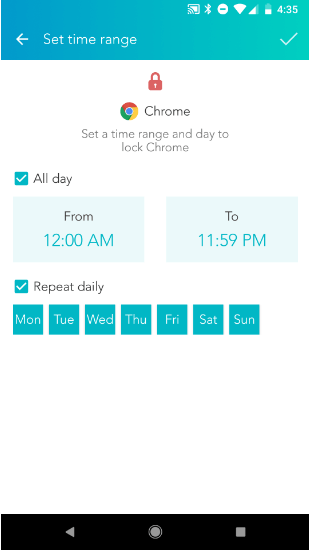 Users can also set their own schedule or particular time range. Once they do, their child will not be able to access that app outside the specified time range. Again, the apps section allow users to block apps in their entirety or set up some more usage periods. They can also set up usage periods for specific days. Then there is also the option of using the same kind of schedule set ups for several different days or multiple days in other words. Other parental control apps such as Boomerang offer user something similar. In fact, we can’t really differentiate Boomerang and Locategy on the basis of app restriction functionality. Let’s move to the device lock category. This category is pretty self-explanatory. If you enable this category then your kid won’t have any opportunity to open any kind of apps on his/her tablet or smartphone. However, the app allows the child to still receive and make calls and send SMS messages in emergency situations. Then we have the web filtering section. This section enables users to specify the type of websites they don’t want their child to visit. The default settings, block about nine types or categories of websites. Locategy also has a set of additional 30 categories. Users have the opportunity to enable or disable any of these categories. Coming to the top again, users can also specify specific domain names that they want to disable if those domain names somehow don’t come under any or all of the categories we have described before. There are always those websites such can slip through the security cracks. Hence, Locategy does a good job of offering users to use some of their own categories or custom domains as well. Our testing research shows that the Locategy web filtering feature works pretty well. It will successfully deny any access to blocked https sites as well. Moreover, users will not be able to use services such as anonymizing proxies to bypass the web filtering feature and access those sites. All of that goodness comes with a rather significant catch though. The catch is that Locategy and its web filtering feature doesn’t work with any other browser other than Samsung and Chrome. Tough luck for parents who use web browsers such as Safari, UC, or the many other mobile browsers. What does that mean for the user’s child? Well, the child could simply install another web browser in order to access any and all of the websites that Locategy had blocked. Firefox Focus is a good choice. The solution is for the user to block all other web browsers which their child could possibly install and then use. That is the only way to make sure that Locategy web filter remains active and effective on your child’s device. However, we know that there is no such option which allows users to automatically disable all apps which the child could install to get past restrictions. Consequently, users can end up spending tons of time just to block all such apps. Not to mention the process would be extremely tedious. Let’s move onto the Locategy remote wipe feature. As far as parental control apps go, this feature is truly a unique one. If we’re talking about security, then the remote wipe feature can also come in real handy. In a situation where the user’s child loses his/her smartphone or tablet, or if someone steals the smartphone, then the remote wipe feature can move in to protect the device. The whole process of using the remote wipe feature requires the user to use the account password. The final section is the Contacts section. This section fundamentally lists all the available contacts or people that are present in the smartphone’s address book. Again, the downside is that the app doesn’t give the user any means to interact with the list in any meaningful manner. 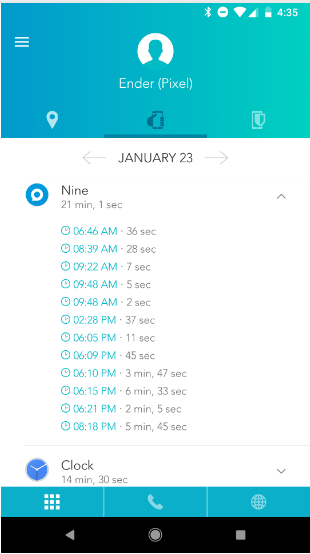 Locategy Child App shows a notification on the user’s phone which is persistent. The notification, as usual, stays in the notification area. Because it serves as a reminder to the user’s kids that the user is monitoring their device. On the face of it, the Child app is relatively simple. And it needs to be in order for a child to use it. To take an example, when the kid opens up the Child app, the app goes ahead and neatly explains or rather repeats the explanation to the child that their parents are currently watching and monitoring their device. Moreover, below the main notification, there is a pretty prominent button which says SOS. The child can press the button in order to send his/her parents an alert. The app will also send the parent the child’s location information once the child presses the SOS button. There is one more option on the child app. And it too appears at the bottom of the device’s screen. This option is for users to unlink the monitored device. As you would imagine, this option only works when the user inputs the account password. There is nothing specifically wrong with Locategy Child app but we have seen better Child apps. More specifically, Locategy Child app needs to have more functions and buttons. For one, we would like the app to actually list all the affected rules that a child’s parent have put into action. This is a feature that Norton Family implements in a very useful way. 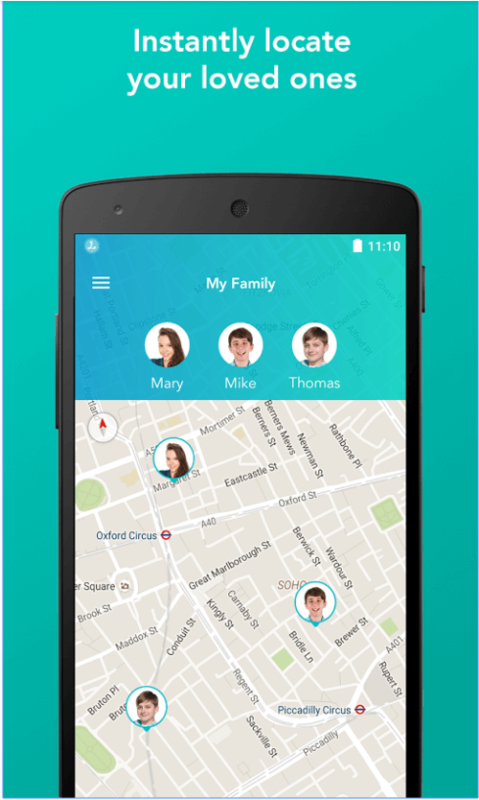 The Locategy Child app could also do with an integrated and secure family messenger. Again, this isn’t us fantasizing about the perfect parental control app. Boomerang already offers this messenger feature. The Android and the web interface of Locategy don’t look as nice (as far as design is concerned) as the iPhone app. We mean that the iPhone app has cleaner iconography. Moreover, it also makes use of whitespace a lot more effectively than the Android app and the web interface. Not to mention, the iPhone app runs remarkably more smoothly than the Android and the web interface. 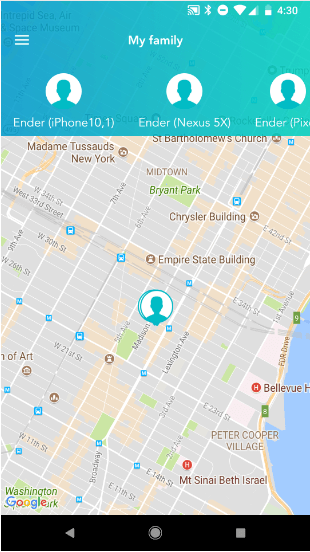 As far as the small screen is concerned, we think Locategy has done its work better on the iPhone platform than it has on the Android platform. The iPhone app is also more organized than the other versions. To take an example, the iPhone Locategy app moves options such as Restriction, Reports, and Location right to the bottom of the screen. But it uses larger icons to represent these options. Additionally, it puts more emphasis on the list of respective subcategories. It inverts the normal colors. And hence, users have an easier time selecting the options from the bottom of the screen. The iPhone app also does not come with those horizontal scrolling issues which we found very confusing on the Android platform. The My Family screen individual child cons have great visibility on the iPhone app. Our research also shows that the buttons which the app uses for locking the device and blocking apps have more visibility as well. How do you set up Locategy on iPhone? The process is the same as it was on the Android platform. Users just have to make sure that they allow Locategy to have all the proper and required permissions. Users have to give certain permissions to Locategy on the Android platform as well. But there are some more hoops that you have to jump through before you can properly use Locategy on your iPhone device. Basically, the user will need to download and then install MDM, or Mobile Device Management profile. After that, the user will have to enable the option known as content blocker on Safari. Users have to follow through these two steps for Locategy to implement all of its features. As we have indicated earlier, the web filtering feature for Locategy will not work on any other web browser. Hence users will have to find a way to block those apps outright in order to ensure that the device’s browsing apps are protected. Ignoring some minute design changes, the parental app for the iPhone is pretty similar to the Android app. But, users don’t have the facility to view any kind of usage reports that the app produces for the monitored iOS device/devices. As a matter of fact, the iPhone app is missing the entire Report tab option from Locategy’s monitored iOS/iPhone profile. Needless to say, the child app one the iOS platform is also pretty similar to the on that Locategy has for the Android platform. The app doesn’t just look similar, it also works in more or less the same manner. What we mean to say is that you don’t need to worry if your kid has a slightly different smartphone device than you. The very important SOS feature seems to work rather seamlessly across all platforms such as iOS and Android. There is no doubt about the fact that parents in the modern world do need a good parental control app. Moreover, they need a parental control app which works effectively on all major mobile platforms. This is a must if they intend to or want to keep a track of what their children are doing in their digital life. There are those parental control apps which offer users a ton of capabilities as solutions to their problems. Locategy has none of those at the time of writing this Locategy review. However, it doesn’t mean Locategy isn’t any good. Locategy has done a good job of streamlining the entire interface. And it has a decently strong location-tracking functionality that works. Parents who don’t have time to learn the ins and outs of a parental control app would appreciate Locategy. what their child is doing online. 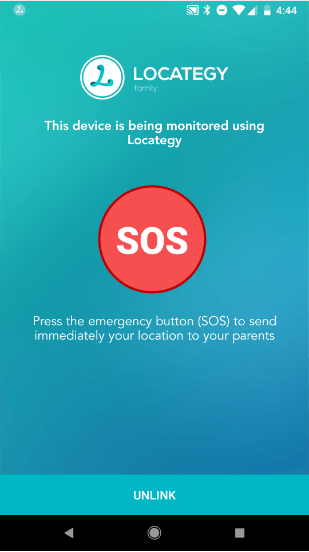 Locategy allows parents to control the apps that their child uses as well. In that respect, Locategy is a pretty good parental control app. For parents who want more of those fine-tuned controls, we would recommend something other than Locategy. Parents also have to keep in mind that Locategy doesn’t support PCs or Macs. Hence for your comprehensive parental monitoring needs, you should go with something like Qustodio.